You should have some idea of the charging current. In case you use an adaptor which is adjustable but of the unregulated, low output current type, you can adjust the current by adjusting the output voltage. You have to know if the current actually flows through the battery. 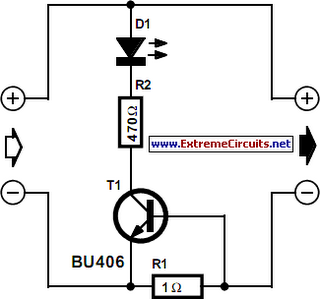 A current-detecting indicator is therefore much to be preferred over a voltage indicator. To prevent you from forgetting all about the charging cycle, the indicator should be visible from wherever you pass by frequently. Using the circuit shown here, the LED lights when the baseemitter potential of the transistor exceeds about 0.2 V. Using a resistor of 1 ? as suggested this happens at a current of about 200 mA, or about 40 mA if R1 is changed to 4.7?. The voltage drop caused by this indicator can never exceed the base-emitter voltage (UBE) of the transistor, or about 0.7V. Even if the current through R1 continues to increase beyond the level at which UBE = 0.7 V, the base of the transistor will 'absorb' the excess current. The TO-220 style BU406 transistor suggested here is capable of accepting base currents up to 4A. Using this charging indicator you have overcome the restrictions 2 and 3 mentioned above.